A Fire King 8 ounce baby bottle in very good conditon. Bottle sold as/is/used. Will charge postage/insurance determined by your zip. A $7 charge for handling/packing will be charged to your purchase. Any questions please email. 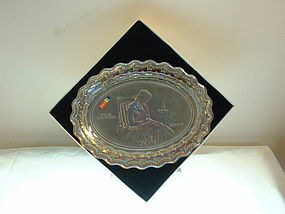 Limited edition plate by Fostoria featuring "The Flag" is the first in the American Milestones Series by Fostoria. Mold destroyed 12-31-71. 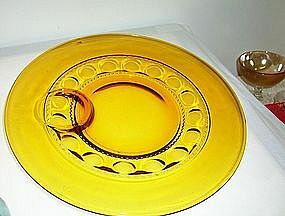 The plate has NOT been on display or been used in any way. Plate was taken out of box for photo only. 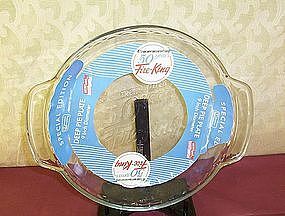 Fire King Commemorative Pie Plate for 50th Anniversary is available for purchase. This plate has the original paper label attached and has NEVER been used. The bottom of the pie plate is embossed with Commemorating 50 Years Fire King. Postage/insurance determined by your zip. A $6 packing/handling fee will be added to order.Any questions please email me. Thanks for checking my listings. 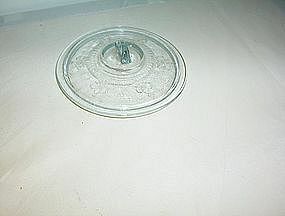 Available is the Blue Fire King round lid approx 4 1/2 inches across. 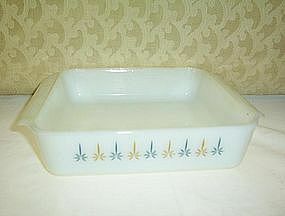 The lid is being offered as USED/Sold As IS. The edges are a little rough either from being banged against the container, shelf for storage, etc or how it was made - it just feels rough to the touch. Will answer all emails. Will accept money order and cashier checks. Will also accept personal checks with UP to 10 days to clear. 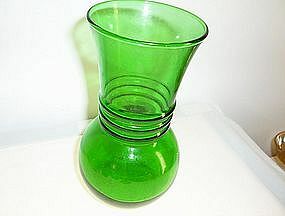 This forest green vase if available for purchase. 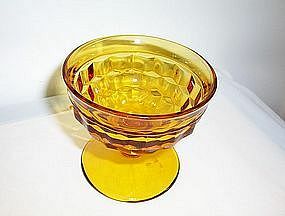 It is being offered as USED/AS IS it is an older vase and has some signs of use/storage/shelf ware. Please email me for any questions. Will accept money orders and cashier checks. Will also accept personal checks with UP to 10 days to clear. 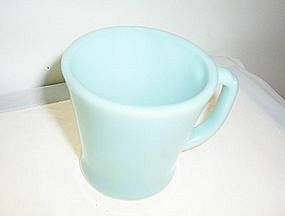 This early 1950 era water/lemonade pitcher is available for purchase. 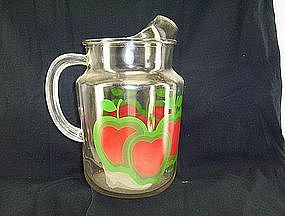 It features the red apple design with no trademark or manufacturer mark on the pitcher. Therefore is being sold as maker unknown. The pitcher is not chipped/cracked or has it been repaired. It does show signs of wear/scratches/fade from being used and being stored for so many years. Will reply to all emails. Will accept money orders and cashier checks. Will also accept personal checks with UP to 10 days to clear. Available are five (5) King's Crown design plates sold separately \ can purchase one or five at $9.99 each plus actual postage from zip 27814 to your USA address. The plates have been USED and do have some physical cues of use/minor scratches, etc. But there are NO chips/cracks/repairs/or visual damage to the plates. Please email me for prompt reply. Will accept money orders and cashier checks. Will also accept personal checks with UP to 10 days to clear. Two golden (??) 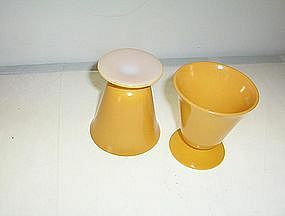 colored dark yellow maybe footed goblets in Good USED condition. The bottom has the Hazel Atlas trademark on each. The glasses are NOT chipped/cracked/nor been repaired. They are SOLD AS IS/WHERE FOUND HOWEVER. They do show the normal signs of use and faint scratches from being used and stored. Any questions please email me I will be happy to reply. Will accept money orders or cashier checks. Will aslo accept personal checks with UP to 10 days to clear.